See pics from the Hall of Fame ceremony here ! 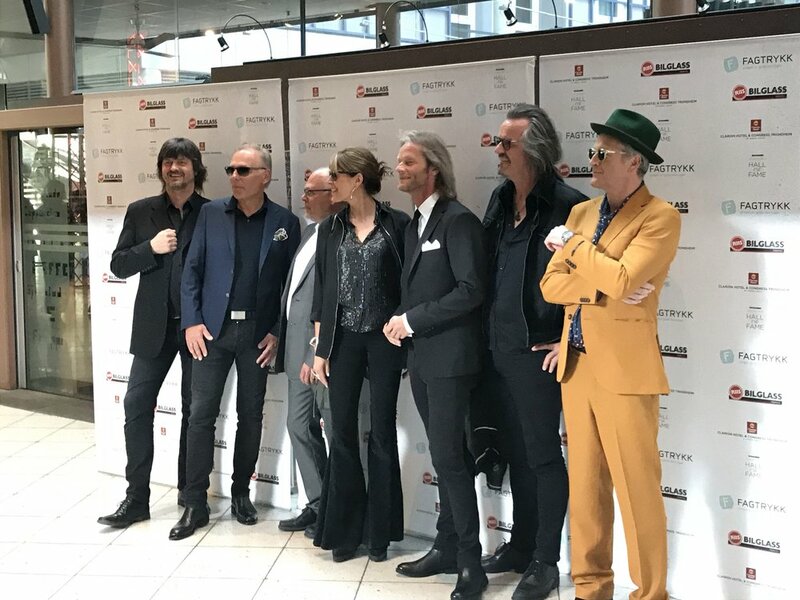 Fantastic night last night at the Olavshallen,Trondheim where Stage Dolls together with fellow artists Kari Bremnes and Morten Abel got inducted into the Rockheim Hall of Fame. The show will be aired on NRK 1 -Channel on Saturday May 2nd 19.55 CET. On March the 17th,The band will perform at the afterparty at Raw Air Ski-jumping in Vikersund, Norway. TICKETS FOR THE 2018 'HALL OF FAME' CEREMONY HERE! The band released a new single on feb 27th called 'You'll find me'. It's a beautiful ballad penned by singer Torstein Flakne. You can listen to it on all platforms (Spotify,Apple music etc.) and download on iTunes. Norwegian AOR Legends Stage Dolls are looking forward to a busy 2018 both in the studio and on the road. Stage Dolls will release a new single on Feb 19th called ‘You’ll find me’. The song is written by lead singer Torstein Flakne and is a wonderful quiet ballad with the band’s solid trademark. - Sometimes you write songs that you just feel a special, Torstein says, this is one of them. I wrote it partly on piano and guitar and we figured in the end the piano version would be the best, Ronny Wikmark laid down some wonderful piano and I’m really happy with the result. The band got the message just before Christmas, they were elected into the Norwegian Rock’n roll Hall of Fame. It came as a surprise to them, although everybody else thought it was about time. -You spend your career doing this and that, you never really sit down and think about all you’ve experienced and achieved, says bassplayer Terje Storli. The band will be elected at a national TV sent ceremony in their hometown Trondheim on May 27th. Torstein,Terje and Morten together with previous drummers Erlend Antonsen and Steinar Krokstad will all be inducted. The band intends to go into the studio sometime in the year to do some new material. No time is set but hopefully we will have something ready for release by fall, says Morten Skogstad. As usual, Stage Dolls will go on a big tour this summer, kicking off in Malmø,Sweden on June 2nd at the Melodic Rock Fest. The tour will go on during the summer ending in September. -We are really looking forward to the Summer Tour, says Torstein, and it’s great to be starting in Malmø, a lot of our international fans will show up, making it a night to remember. Finally, the year will end as in 2017 with a big Christmas tour in Norway covering the big cities. As the previous years, they will be accompanied by their AOR friends Return. -Last year was amazing, says Torstein, we had a great time together with Return and our fantastic fans. We are always a little worried before a tour if people will show up but 2017 was incredible and hopefully 2018 will be the same. åre egne AOR-legender Stage Dolls er allerede godt i gang med å planlegge 2018. Året vil inneholde både konserter i inn- og utland, studioarbeid og ikke minst heder og ære. 19. februar slipper Stage Dolls en ny singel ut på markedet. Låta heter ‘You’ll find me’ og er spilt inn i New York og Trondheim. Det er en rolig ballade i kjent Stage Dolls-Still som nok vil røre ved de fleste. -Noen sanger føler du det er noe speilet med når du lager dem, sier vokalist Torstein Flakne, denne er en sånn. Den ble skrevet på piano og gitar og vi landet på piano-versjonen, mye på grunn av pianist Ronny Wikmarks delikate spill. Like før jul fikk gutta beskjed, de var innlemmet i Rockheim Hall of Fame. Det var en overraskelse for dem selv, men omverdenen har ventet på det lenge. - I løpet av en lang karriere gjør du mye rart og tenker kanskje ikke så mye over vær opplevelse og øyeblikk men det er klart, når vi ser oss tilbake så ser vi at vi har nok gjort noe riktig, humrer bassist Terje Storli. I tillegg til Torstein, Terje og trommeslager Morten Skogstad vil også de tidligere trommeslagerne Erlend Antonsen og Steinar Krokstad bli innlemmet. Planen er å gå litt i studio i løpet av året. -Ingen tidspunkt er satt ennå men vi må vel få til noe med kanskje release utpå høsten, sier Morten Skogstad. Låtene vi ga ut i fjor ble meget godt mottatt og det gjør at det er lett å gi gass i år. Den 2.Juni fyrer Stage Dolls av sin vanlige sommerturné, denne gang i Malmø i Sverige under Melodic Rock Fest. Turnéen vil vare til i september og Norge fra nord til sør vil som vanlig få besøk av bandet. Mer info kan du få på stagedolls.com og facebook.stagedollsmusic. Som vanlig drar gutta i år som i fjor ut på juleturné sammen med sine gode venner Return. - 2017 var bare helt fantastisk, sier Torstein, det ser ut som Return, vi og vårt utrolige publikum har laget en tradisjon som bare blir festligere og festligere. We had a great night in Madrid on Oct 13th. Nice to see all the fans, not just from Spain but also from Portugal, even South Korea :) Thank you everyone for making this a special night for us! HERE'S A REVIEW! Stage Dolls will play the DD 2 Festival A Night To Remember at the Sala Cool Stage in Madrid on the 13th of October. This is the first time the band visits Spain and they're looking forward to meet the Spanish fans. You'll find new photos in high and low res and press releases in both English and Norwegian under Press Material here on the site. In 1991, Norwegian star trumpeteer Ole Edvard Antonsen together with producer Bjørn Nessjø asked to record Torstein's song '5000 Miles' for Ole Edvard's album 'Tour de Force'. Torstein joined in and sang on the chorus. When Ole Edvard Antonsen was asked to play at the Noble Peace Prize Concert in 1994 he chose to play '5000 Miles'. The album 'Tour de Force'has sold over 150000 copies in Norway, and still counting. '5000 Miles' was later also recorded by Norwegian singer Morten Harket (from a-ha), titled 'Spanish Steps'. On Wednesday Aug 9., Ole Edvard Antonsen celebrates his music spanning over three decades with a One Night Special Concert in Elverum, Norway together with his own band and guest stars Frode Alnæs and Torstein Flakne.